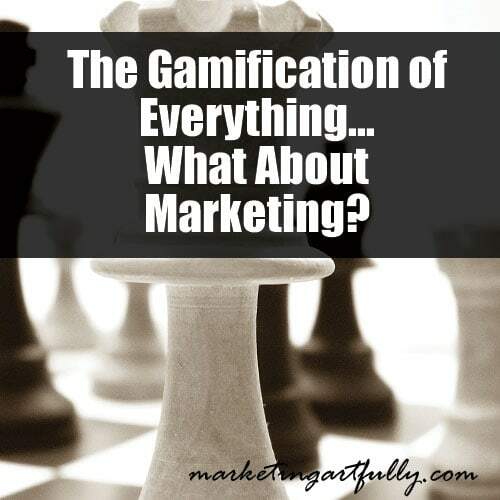 The Gamification of Everything - What About Marketing? You are here: Home / Small Business Marketing / The Gamification of Everything – What About Marketing? The Gamification of Everything – What About Marketing? Today it seems like gamification is the buzzword, generally I hear about the gamification of everything, but what does that have to do with marketing? First off, what is gamification? It is taking every day things that we HAVE to do and making them a game instead of work. So, I got a Fuel Band for my Anniversary from my husband so we could move around more. In general, it counts our steps, adds what calories we burn living and gives us Fuel Points which should reach 2,000 a day. So, I am a marketing person, we spend LOTS of time behind a computer and my fuel points are deplorable. Enter the game, constant checking and a goal to reach and soon I am moving around more and expending more calories. PLUS if I move around enough, at the end of the day the little guy on my App will do a dance. Second off we work with a great Enterprise level gamification company that does all kinds of data integration, etc. They have been with us for a while so gamification in the capital G sense has been on my radar, but I never could see how it could scale down to our little peeps (or my smaller marketing company). So, today I am laying out the framework for a game that will help people sift down what marketing they should do, and because I blog better than I work on my business, you guys are coming along for the ride! ..not sure how this is going to work, but will keep you informed! PS – Can you let me know of any aspects of the business world that you are more or less intrigued about doing gamification marketing with? Previous Post: « Internet Marketing – Should You Write Major And Minor Blog Posts?